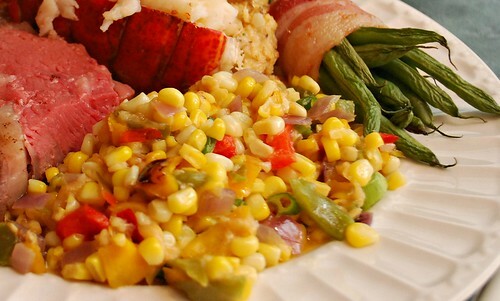 To accompany the surf and turf, I made the Creamy Summer Corn of Chef Matt's Menu. Bell peppers, corn, green onions, red onions, garlic, heavy cream and Manchego cheese blend nicely as a colorful side dish. What made this really stand out was the ancho chili butter that was stirred in before serving. The recipe for the butter yields quite a bit, which makes for great uses in other dishes! Bring a small saucepan of water to a boil; add dried chiles and simmer over low heat until softened. Drain water and discard. Combine softened ancho chiles and garlic in food processor bowl fitted with a steel blade and puree until smooth. Add Plugrá Butter, cilantro, green onions, lime zest, lime juice and kosher salt and pulse until mixture is completely blended. Transfer ancho chili butter to plastic wrap; form into a log shape and chill. Combine roasted red pepper, corn, green onion, red onion, cilantro, garlic, olive oil, salt and pepper in large saucepan and toss to blend. Add heavy cream and shaved Manchego cheese: simmer over low heat until cream is reduced by half. Add 8 tablespoons ancho chili butter and stir until blended. Garnish with 1 teaspoon chopped green onions and serve.